It's a much faster and easier process. The results produced over the different versions have always come out well but this year they just seem smoother. I'll start at the beginning as if you've never heard of Aurora HDR. The real gem of this software is the ease with which it can merge multiple exposures into one 'HDR' photo. The idea with HDR photos is that you take 3 photos all at different exposures. So one will be underexposed, one overexposed and one with perfect exposure. This allows you to grab details from each part and really bring the photo to life. 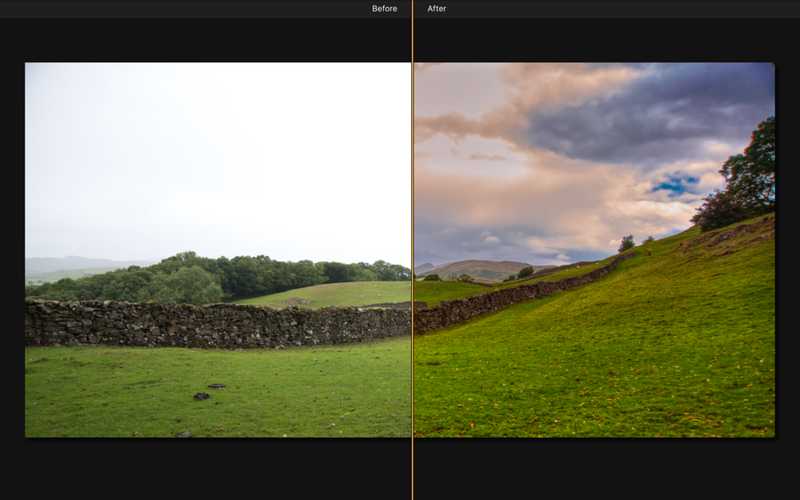 Although this is often the typical and traditional way to creating HDR photos you can use a single photo. In fact you can use a single JPEG although RAW files work better. The first photo I used was a single RAW file. You can see the before photo was lifeless and the sky had nothing about it. The finished photo was a wow without being over the top, it brings it back to life and takes be back to the moment I took the photo. The way I tend to approach my editing is I find a Look (previously preset) which are sorted into categories, and I will then tweak the sliders to suit. You can of course find a Look and stick with that or create a few of your own and name them as you wish. The sliders down the right are as you’d expect from most other photography editing software. They feel natural and even of the first attempt at using Aurora you can easily find your way around. I’ll be creating more videos over the coming weeks as I really get to grips with it. This below is the first photo I edited using it. If you have any questions about the software or you’d like me to show you something in a video then drop me a comment below.